A sheltered site in full sun. In colder areas grow against a south-facing wall or under cover. Figs grown as pillars or espaliered plants can be planted closer - 45cm (18in) apart, and gradually thinned to the best specimens. Reasonably tolerant, but the tips of branches carrying fruit can be damaged in cold weather so protect branches with horticultural fleece in winter in cooler regions. Cold also can kill plants back to their roots, from which new plants often re-grow. Top-dress the root zone with a balanced organic fertiliser each spring, and mulch with well-rotted organic matter year round. When growing figs in containers, apply liquid tomato feed every 2-3 weeks once fruits appear. Strawberry and Marigold. None. 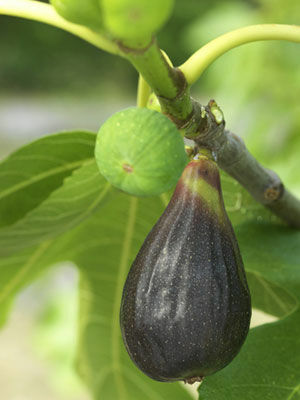 Figs have large leaves that shade out other plants. Plant in containers or in a hole lined with solid material that the roots cannot penetrate to encourage fruiting. Fruits are ripe when the skin feels soft and starts to split when gently squeezed. Figs can be dried or made into fig preserves but otherwise do not store well. May suffer from red spider mite when grown under cover. Can be controlled using soft soap or by increasing humidity. Net figs to protect from birds, squirrels and wasps. Even with netting, ants sometimes invade the open centers of figs.